Bitcoin casinos fill the Bitcoin gambling market, but more brands that specialize on only one game have started to become popular in this niche. Bitcoin dice games are perhaps the most popular when it comes to this area, but other brands also make a name for themselves. Take CoinVegas for instance. I chatted with Gian, a CoinVegas representative, to know more about the brand. Can you tell me how you came up with CoinVegas? Coinvegas was born circa one year ago as a side project to test out the Litecoin daemon. In fact the first coin we have supported was, obviously, Litecoin. After a bit we have seen that people found our site and were enjoying it, so we kept everything online and improved the UI. Later came Dogecoin, Peercoin and in the end Bitcoin. The market for Bitcoin gambling sites is growing. What makes your brand unique? What makes us different from the other sites is that we focus more on a single game instead of having a lot of games which can distract the final user. You mentioned CoinVegas was not primarily designed for Bitcoin. What can you say, though, about the rise of Bitcoin and its effects on the online gaming industry? I’m very confident about the future of Bitcoin, not only as a currency. There is more behind it. I like particularly the possibilities that the blockchain offers, free-market, better privacy and smart contracts. Last but not the least the fact that cryptos have no frontiers, giving the users the possibility to move their money wherever they want and do whatever they want with it. This includes playing on sites they like, like CoinVegas. Do you mind sharing with us the plans you have for your brand? Our team is little, but efficient and at the moment we are working to make the site more mobile-ish. We’re adding new games too. But not the usual games like blackjack, poker or dice. Instead we are planning to add typical regional games like Sette e Mezzo for the Italians, Schnauz for the Germans, etc. We are also working to make the bitcoin buy process easier, with a system that allows users to pay with prepaid card. 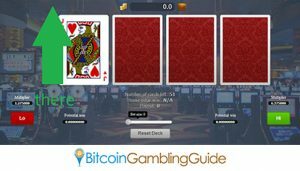 With this we will also try to bring the traditional gambler to Bitcoin gambling, which is better as it offers more. Great plans, Gian! Thank you for your time.